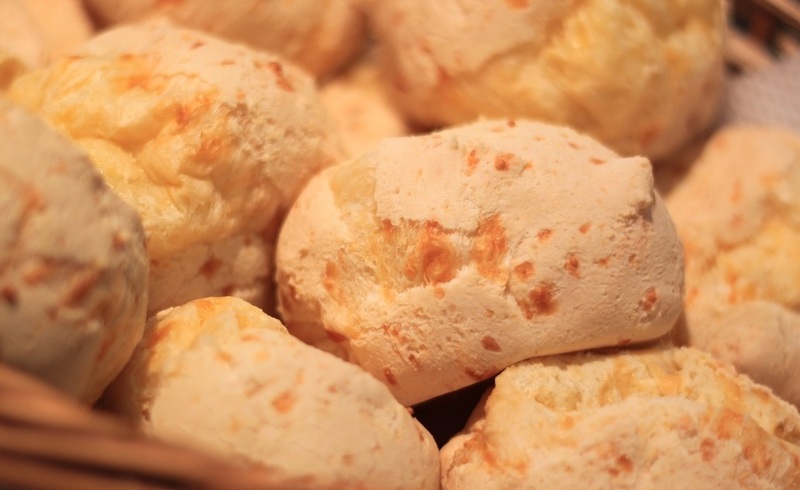 Cheese bread is a baked cheese roll, a popular snack food here in Brazil. It is mainly made of cheese and tapioca flour ("povilho"). Commonly served in brazilian hotels for breakfast. As I describe in my about section, I received a lot a complains from my overseas friends about this recipe. They couldn't find a good Brazilian Cheese Bread Recipe online! Well, there are many cheese bread's recipes out there, but none are authentic / original. Also, not as good as the ones made over here in Brazil. So without further delay, please find below the ingredients and instructions for the best brazilian Cheese Bread in the world! Tip: Check the items you have before starting. This Brazilian Cheese Bread Recipe contains a lot of ingredients which may have a different name in your country (or region). If you don't understand what a cheese bread's ingredient is, just follow the link to the ingredient page and you will see a typical picture of it. Preheat oven to 200 ºC (medium temperature). Choose 2 non-stick baking sheet (If you don’t have any non-stick baking sheet anoint them with oil). Put the water and the oil in a saucepan and place over medium heat, wait until it boils. Meanwhile, mix the tapioca flour and the salt in a large bowl. Once the oil and water are boiling place it slowly over the mix of tapioca flour to scald. Mix it vigorously with a spatula (or a bamboo spoon) until incorporate all the liquid ingredients. Wait until the mix has cooled down (if it is hot the eggs will become omelette and the cheese will be melted) and add the grated cheese mixing well. In a small bowl break one egg at the time to make sure they are good and then pour the eggs into the mixture, (one by one) mixing very well each time you add an egg to incorporate it completely. The dough won’t be flat. But that’s all right the texture is a bit rustic and has groats of tapioca flour. Although it is important that all ingredients are well mixed, with no liquid ingredients apparent. Bake for about 30 minutes, until they are puffed and golden. Withdraw them from the oven and serve warm. To freeze them, take the baking sheet to the freezer and wait until they are firm. When they are firm transfer them to a ziplock bag. Doing it the bread cheese won’t stick. To bake the frozen ones, preheat the oven 180 ºC (medium temperature) and you can bake the frozen bread cheese.